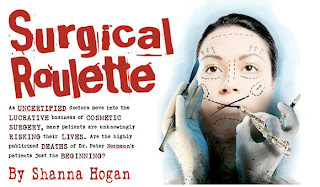 While the cosmetic horror stories described by the patients of Peter Normann represent some of the most egregious in the state's history, research shows they are part of a larger and growing danger of ill-equipped and inadequately trained plastic surgeons performing invasive cosmetic procedures.Normann, an emergency room and internal medical physician, was never certified as a plastic surgeon. In other cases, some Valley physicians certified to practice as gynecologists or even ear, nose and throat doctors have been found to be practicing cosmetic surgery, many with little more experience than a weekend training course. The results are patients being left scarred, disfigured, and in three of Peter Normann's cases, dead. In response to the growing number of phony plastic surgeons, the Arizona Medical Board released a Guide to Choosing a Cosmetic Surgeon. You can find it here. Even here in Metro Detroit there are numerous physicians who are performing plastic surgery with little more than a weekend course's training. If you are thinking of having plastic surgery, make sure your surgeon is certified by the American Board of Plastic Surgery. All members of the American Society of Plastic Surgeons are certified by the American Board of Plastic Surgery, so this is a good place to find a plastic surgeon for you. I guess the problem is with the state or federal laws. We should not allow a gynecologist with one week of training to perform a facelift. Speaking of gynecologists-turned-plastic surgeons, my sisters gynecologist recently offered her info about her (the gynecologist's) new cosmetic undertakings. Not sure if the doctor plans to do surgeries, but she's definitely doing in-office procedures. My sister switched to a different gynecologist. Hello, I subscribed to your interesting posts I couldn't agree more. Here in Utah we have a few "cosmetic surgeons" who are in actuality family practice, OB, internal medicine or oral surgeons claiming to be plastic surgeons. One near my office had the audacity of telling a patient (who I later saw), that he is "better" than a plastic surgeon because he is strictly a "cosmetic surgeon". He is the one who fixes the plastic surgeons mistakes!!! I can't understand why a person seeking a cosmetic surgery procedure, especially facial, would consider any doctor who didn't complete a plastic surgery residency.